We recently launched our Facebook page where we will be posting tips, tricks, kitchen misses, and mini-recipes (i.e. cocktails, etc.). However, we are more thrilled about the opportunity to interact with our followers. 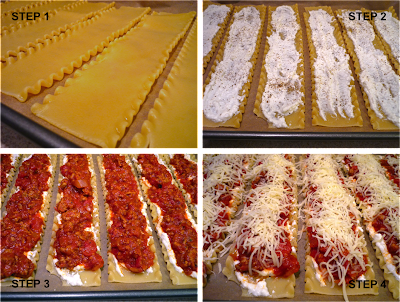 One of our Facebook followers requested a lasagna recipe so today I give you: Lasagna Rolls. These rolls are easy to make and I love to cook things for individual portions (hence, the mini lemon cakes you saw previously). They are also perfect for making on the weekend and having some left over for weekday lunches. For this recipe, I used a sauce that is very similar to my turkey spaghetti recipe. However, I like to make the sauce thicker so I nix the tomato sauce and only use the crushed tomatoes and tomato paste. It helps everything to stick together without running all over – you’ll thank me when you’re rolling these with your bare hands :) I haven’t tried this with other lasagnas before but I’m sure it could work with any! You could use spinach and butternut squash or any other combination you think would work. Actually, I happen to have a recipe for just that…maybe you’ll see it on the No Pressure Cooker soon! Brown turkey in a large saucepan over medium-high heat. When half of the turkey is browned, add onion and garlic. Cook until all turkey is browned. Add crushed tomato, tomato paste, 2 tsp salt, 2 tsp pepper, sugar, seasoned salt, garlic powder, red pepper, Italian seasoning, and bay leaves. Stir until well mixed. Increase heat to medium-high and bring sauce mixture to a boil. Boil for 5 minutes. Stir and reduce heat to low. Allow sauce to simmer as long as possible – at least 20 minutes. Pour sauce into a bowl and place in the freezer to allow the sauce to cool slightly before preparing the rolls. Cook pasta according to directions on package or until al dente. Be sure not to overcook the noodles. Drain and dry noodles with paper towels. Lay cooked noodles on a cookie sheet lined with parchment paper to prevent slipping. Spoon a layer of ricotta on each of the cooked noodles. Sprinkle with 1 tsp salt and 1 tsp pepper. Follow with layers of sauce and mozzarella. Loosely roll each of the noodles and place into a 13”x9” baking dish, lightly coated with cooking spray. Top each lasagna roll with more sauce and mozzarella. Place baking dish in oven and cook at 375 for 30-40 mins or until sauce is bubbly and cheese is browned. Remove from oven and allow to cool slightly before serving. This is a bit time-consuming but there are ways to make this an easy weeknight meal. This lasagna sauce freezes very well, so make ahead and freeze for months! (This also works for spaghetti sauce.) When you’re ready to make your rolls, just take the sauce out in the morning and sit in a tub of cold water in the sink. It should be thawed by the time you get home from work. Or, you can allow it to thaw slowly in the refrigerator for a day or two. Bon appetit! Note: Thaw time will depend on the amount of sauce that is frozen.